We are furnishing the Cabin with used furniture for the most part, things my brother has in storage. I am adding bits and pieces with a pine cone theme. My husband rolls his eyes at this and my brother shrugs, he doesn’t care. I am going to be spending quality time up there so I am looking for fun things to live with the next many years. I have learned my lesson buying inexpensive dishes over the years, they chip and break easily. I spent many hours searching for dishes with a pine cone theme and finally found these. They aren't cheap but they are heavy and microwave and dishwasher safe. They are made by Emerson Potteries in Virginia and they will last for a long long time. I believe in buying quality, something that will last and not have to be replaced in a few years. They feel really sturdy and I am really excited about using them! 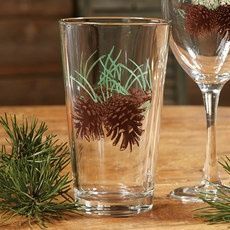 I tried to economize on glasses and bought some cheap ones at a discount place and when they came out of the dishwasher, the pine cone design was half off. So I went online and bought these that are dishwasher safe. Again, not cheap, but I think they will last. We will be sharing the cabin with small four legged creatures probably. I wanted something to protect food. I found these Ransburg vintage canisters on Etsy and they are old and funky. A few scratches and dings already but who cares. I love their look! I wanted a few small glasses so I found these on Ebay. They are called Tiara Ponderosa Pine and they are juice glasses, about 4 1/2" tall. They were made by Indiana Glass from 1980 to 1998. This was a just because purchase. There really isn't any room for what I call jinkies at the Cabin but I couldn't resist this tiny pitcher. I have a weakness for pitchers and it just spoke to me. Well you need at least one snuggling pillow on the sofa! Got the brown one, definitely not needed but what can I say! I bought a few other things but will save them for the reveal when the Cabin is furnished. It is coming along! 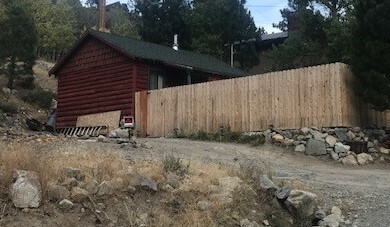 My brothers and I bought a cabin in the Eastern Sierra between Gull Lake and Silver Lake. It is next door to my brother's house so it was a great opportunity to add more space to his house and create a family compound, so to speak. It is very old (it was built in the 40's probably and moved to the current location from a motel resort in the area in the 50's), very tiny, very rustic, but it has lots of potential. It has 2 small bedrooms, a tiny bath with a shower, and a tiny kitchen area, no oven, only burners. We won't starve, there is a fancy resort across the road with a restaurant! I love the fact that the cabin is available year round. It is just off Highway 158 which is plowed in the winter so we will be able to use it all year. We are currently working on it because everything needs work! This is what the interior walls looked like after my brother took off the old paneling. These are old half logs, actual logs that are rounded on one side and flat on the other. This photo was taken after my brother filled in the open cracks between many of the logs! You could see daylight through them! This is that same wall with the new paneling that is going up over the old half logs, quite a difference! This is the flagstone we had installed that will be behind the gas stove. First thing we did was redo the heating for the cabin. Flooring and the new stove for heat should be in by mid July and we can start using it after that. I keep heading up there to check on the progress being made! This is the view of Horsetail Falls from above the cabin. In the spring, there are several falls to watch as the snow melts. A definite work in progress, but we are getting there!